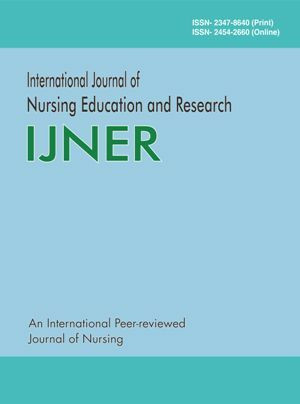 International Journal of Nursing Education and Research (IJNER) is an international, peer-reviewed journal devoted to nursing sciences. 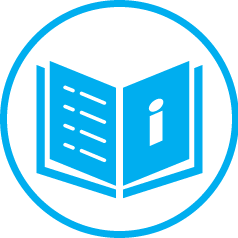 IJNER's aim is to promote excellence in nursing and health care through the publication of clinical information and original research. IJNER publishes Original Research Articles, Short Communications, Review Articles in all areas of nursing sciences. All submitted manuscripts should contain original work neither published previously nor under consideration for publication elsewhere. Articles shall be accepted from any country provided submitted in English language only. There is no page limitation for articles; however authors must strive to present their results as clearly and concisely as possible. Authors, in their cover note to Editor, shall have to clearly mention whether the manuscript is to be considered as a Research article, Short communications or a Review article. Manuscripts shall go through a peer review process to adjudge their suitability and authenticity, for publication in the journal. A confirmation about the acceptance of the manuscript will be sent to e-mail address of the corresponding author. Please check your e-mail account frequently, because you will receive all important information about your manuscript through e-mail only. Authors should submit the articles only in MS-word 2003 or 2007 format, no other format is accepted. If equations were used it should be converted by using MS Office equation editor and pasted as image at proper place. All equations should be grouped or may be prepared using equation editor software. Articles should be typed in single line spacing with "Times New Roman" font pattern. Manuscripts should be submitted as per order: Title Page, name of author (s), Abstract, Key words, Introduction, Material and Methods, Results, Discussion, Acknowledgements (if necessary) and References. If the Result and Discussion sections are combined, then a Conclusion section should be added. The first page should contain a concise and informative title, the names and addresses of the authors and contact details of the corresponding author (postal address, e-mail, and fax and telephone numbers). It should be about 200-400 words. Key words: A maximum of 5 key words must be given at the end of the Abstract. This part should define the background and significance of the study by considering the relevant literature, particularly the most recent publications. Please provide concise but complete information about the material and the analytical, statistical and experimental procedures used. This part should be as clear as possible to enable other scientists to repeat the research presented. In this part, the same data/ information given in a table must not be repeated in a figure, or vice versa. It is not acceptable to repeat extensively the numerals from tables into text and give lengthy and unnecessary explanations of the Tables and Figures. This part must be written with reference to the tables and figures and by considering information from the literature. Statements made in the Introduction and Results sections should not be repeated here. If necessary, a brief Acknowledgements section may be included. Daharwal SJ, Saraf Swarnlata and Saraf S. Spectrophotometric method for simultaneous estimation of amoxicillin and tinidazole in tablet dosage form. Indian Journal of Pharmaceutical Education and Research .2007; 41 (1): 35-41. Stacey GL and Keen NT. Plant-microbe interactions. Chapman and Hall, New York.1996. Mandell GL. and. Petri WA. Antimicrobial agents: penicillins, cephalosporins, and other ß-lactam antibiotics. In Goodman and Gilman`s. The pharmacological basis of therapeutics, Edited by Hardman JG and Limbird LE. McGraw-Hill, New York. 1996; 9th ed: pp. 1073-1101. Daharwal SJ, Grag G, Saudagar RB, Saraf Swarnlata and Saraf S. Methods of estimation of multi-component formulations: A review. Available from: URL: http://www.pharmainfo.net/ volumes-and-issues/2006/vol-4-issue-3. Photos or drawings must have a good contrast of dark and light. Legends of figures should be brief, but complete and self-explanatory so that the reader can easily understand the results presented in the figure. Figure legends should be attached to the figures. All figure number should be arranged orderly, the figures should not be supplied separately but pasted in the proper place. Figure number and title should be given below the figure, the content of the figure should be explained in the title of figure. All tables should be numbered in order with grid lines. The table number should be properly given, large size tables should be split into two or more tables so that it can be accommodated within the page size. Table width and cell sizing should be even and all the content should be left side aligned. Number of the tables and title should be given above the tables and without any border, shading. Do not give on separate page. The table should with a brief but complete and self-explanatory caption so that the reader can easily understand the results presented in the table. Please do not duplicate material that is already presented in the figures. When reporting experiments on human subjects, authors should indicate whether the procedure follows were in accordance with the ethical standards of the responsible committee on human experimentation. Do not use patients' names, initials, or hospital numbers, especially in illustrative material. Papers including animal experiments or clinical trials must be conducted with approval by the local animal care or human subject committees, respectively. Author(s) shall declared the conflict of interest Yes/ No before submission of manuscript for publication. The conflict of interest as mentioned in manuscript before references section or by the use of any free plagiarism checker, the author(s) shall provide the plagiarism report with submission of manuscript. On acceptance of the manuscript, corresponding author will have to pay Rs. 1180/- (One Thousand One Hundred Eighty rupees only for domestic authors} (Inculding Indian Govt. GST 18%) or $ 100 (One Hundred US Dolor only for Foreign authors), as processing cost. The amount shall be remitted as demand draft payable at Raipur, in favor of A and V Publications. The one printed copy of journal will be posted against the paying of processing fees at the postal address of corresponding author (At Indian Address) . Also one pdf copy of published manuscript shall be send as attached documents at your email. There is no processing fee for co-authors.. The article entitled _________________________________is herewith submitted for publication in International Journal of Nursing Education and Research. It has not been published before, and it is not under consideration for publication in any other journal (s). It contains no matter that is scandalous, obscene, libelous, or otherwise contrary to law. When the article is accepted for publication, I/We, as author/authors, hereby agree to transfer to International Journal of Nursing Education and Research all rights, including those pertaining to electronic forms and transmissions, under existing copyright laws. I/We agree that copies made under these circumstances will continue to carry the copyright notice that appeared in the original published work. I/We certify that I/We have obtained written permission for the use of text, tables, and/or illustrations from any copyrighted source(s), and I/We agree to supply such written permission(s) to International Journal of Nursing Education and Research upon request.